Sanaya Singh, lecturer in Social Work at the University of Gävle, danced her way to victory with the song that is about the hidden messages in her eyes. Every year there is a contest held over the whole world for Indian girls that live outside India. Approximately forty countries take part and they take turns in arranging the competition, which was held for the twenty-fourth time this year. The aim every year is to find a global ambassador for India from each country. It is a talent and beauty contest that also has a social purpose. Sanaya was invited to take part by the organisers and she won the Swedish division of the contest. “I started to prepare myself and was very nervous. I am a trained dancer and confident about performing on stage, but this was a completely new challenge that in the end I accepted, and it felt like fun,” says Sanaya. She was one of forty girls from all over the world that arrived in Mumbai last summer. They stayed in a five-star hotel for a week, where they were trained with the help of a choreographer and professional models. Amongst other things they practised dancing in groups, public speaking and modelling. Sanaya performed classical dance, a folk dance and a Bollywood dance. She also mixed four songs to make one song, that she sung. As the winner one was expected to travel to about five to ten of the competitors’ countries. One travels as a global ambassador for Indian women. One could be invited to talk about, for example, social work within different organisations, women’s groups or other Indian groups that want to exchange experiences and improve their procedures. Sanaya has chosen specifically to raise the issue of honour killings, their connection to violence and repression. This is because it is, unfortunately, a common issue in India, Sweden and many other places around the world. 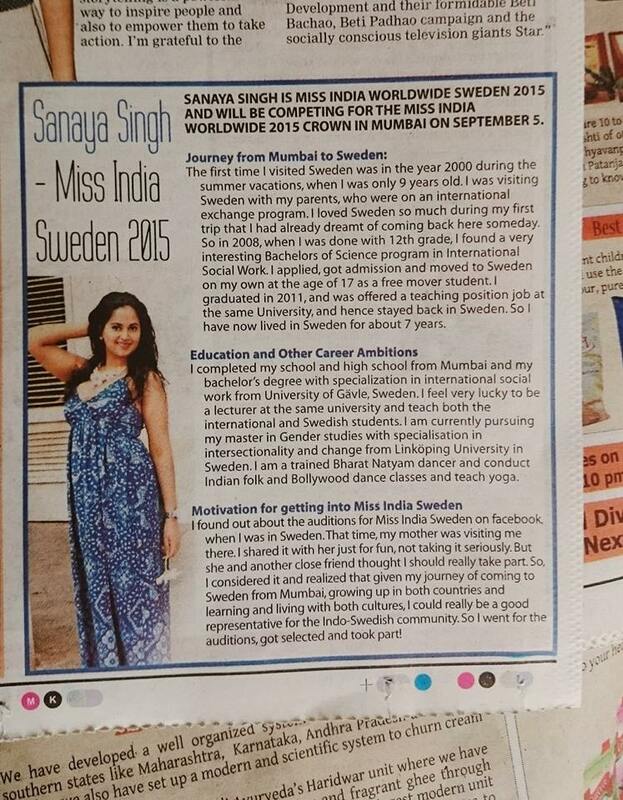 “The possibility of acting as a cultural ambassador for both India and Sweden was an important matter for me. At a young age I got a chance to become aware of both of these cultures. I grew up in India and at the age of seventeen came alone to Sweden to study the International Social Work Programme at the University of Gävle. Nader Ahmadi, who later travelled to India and talked about the International Social Work course. Sanaya wanted to read the degree course and thought; what better land to study in than Sweden with its social welfare policy. Sanaya wanted to learn about it and return to India with her knowledge.